I believe that Boston Omaha (BOMN) is a short. The stock was previously written up on 6/8/2017 by “Bluegrass” as a long at $14/sh (the expected public offering price at the time; the deal wound up pricing at $13). Bluegrass’ write-up provides a good overview on the brief history of the company as well as the principals involved. It has proven to be a good call so far, as the stock is up 50% since the IPO this summer. BOMN is a shell company controlled by two hedge fund managers (one of whom is Warren Buffett’s grand-nephew). The managers are good marketers of their stock, and write good letters (there are two that are available on their website: 2015 and 2016; they are worth a read). BOMN is fairly simple to analyze. It is a shell company that contains cash and a few small operating businesses (primarily in insurance and billboards). Book value is $10.23/sh and TBV is $8.27. Given that the operating businesses were purchased over the last couple of years, I am willing to give the company the benefit of the doubt that it paid reasonable prices, and thus think the goodwill and other intangibles have economic value. Therefore I think book value is a more reasonable proxy for fair value than TBV. Still, the company has $102mm, or $7/sh, of cash on the balance sheet. In many ways, this is akin to a “search fund” or a SPAC. At the current trading price, investors are paying $19.50 for $10.23 of book value (1.9x book), of which $7/sh is just cash. Ex the cash, investors are paying $12.54/sh for $3.23/sh of book value (~3.8x book value). Outside of the cash, what does BOMN own? Based on the purchase prices, these businesses together are worth $47mm, or $3.27/sh (this foots with the book value ex cash). While there are likely some synergies which could arguably make these businesses worth more than the purchase prices paid, there are also numerous dis-synergies in the form of corporate overhead/G&A. At this point, I think it’s generous to value this at Book Value without capitalizing any of the corporate expense. Pro forma for acquisitions, 2016 Revenue was $6.3mm, and Net Income was ($2.86mm). G&A was running at roughly $1.2mm/yr. In 2Q 2017, Revenue was $2mm and Net Income was ($1.37mm). G&A was $400k (annualized: $1.6mm). Right now, the company is sub-scale and money-losing. In general, the market values publicly-traded, controlled holding companies at discounts to NAV. Think about the Liberty complex, IEP, Pershing NV, Steel Partners LP, HRG, BH, and many NOL shell companies. Vehicles such as this tend to trade at discounts. BOMN is trading at a 90% premium. The co-CEOs will each receive base salaries of $275k/yr (starting in 2018), and a bonus pool, “equal to up to 20% of the amount by which our stockholders’ equity for the applicable fiscal year (excluding increases or decreases in stockholders’ equity resulting from any issuances, purchases or redemptions of our securities) exceeds 106% of our stockholders’ equity for the preceding fiscal year.” Note, there is no high water mark. BOMN would have to increase Book Value by around 100% (gross of the bonus pool payments) in order for the Book Value to match the current stock price. I think Fair Value today is roughly Book Value, and I could see the stock trading at 70 – 110% of Book Value as a reasonable range (again, most controlled holding companies trade at discounts). Therefore my price target range is $7-11/sh, for downside of 44-64%. - The biggest risk to the short in my mind is that the company has access to better/proprietary deal flow at discounted prices. Perhaps families looking to sell their businesses could see BOMN has the type of buyer they want to be associated with (long-term oriented, not one to slash employees, etc) and therefore sell their businesses at a discount. - Low liquidity (though a borrow is readily available and cheap). - The promoters have proven to be successful marketers of their stock/story thus far, which could continue or increase. - Interests are indeed well aligned between the principals and investors (insofar as they have large personal investments in the company; less so insofar as they get a 20% carry over 6% book value growth with no high water mark). We had short exposure to BOMN at the time of submission. We have no obligation to update the information contained herein and may buy, cover, or sell shares at any time for any reason. We make no representation or warranties as to the accuracy, completeness or timeliness of the information contained in this presentation. We expressly disclaim all liability for errors or omissions in, or the misuse or misinterpretation of, any information contained in this presentation. This does not constitute an advertisement or an offer to sell or a solicitation of an offer to buy any securities. - Market valuing this like typical controlled holding companies. - Slow or no growth in book value which may make investors question the premium they are paying for the company. i'm curious how this entity is taxed? if corporate tax rates go to 20%, what are the limitations of setting up publicly traded companies to be primarily vehicles for investing in common stocks (how much passive investments are allowed)? I believe BOMN is taxed as a normal US corporation. My understanding is that BOMN's focus will be on buying operating businesses rather than publicly-traded securities. On your second question, here is a correspondence from the Daily Journal Corporation to the SEC in 2013 in which they explain why they should not be treated as an Investment Company. I think it should help answer your question. Separately, I believe that Munger has been fairly vocal (his last shareholder meeting, perhaps) about why owning public stocks via corporations (rather than pass-through entities) is not optimal. Bought a tiny insurance company that is so small terms weren't disclosed. I bet the next deal will be for a minuscule candy company. Sardar Biglari executed on buying a tiny insurer, but couldn't avoid the siren song of maxim models. C'mon - there are gullible retail investors that will believe this is Berkshire Hathaway v2.0! This just gets better and better. As of 9/30, more than 40% of Magnolia Capital is invested in BOMN (obviously more given the recent run up) . So not only does Peterson get incentive fees on the performance of BOMN, but he gets incentive fees on the performance of BOMN within Magnolia. Same goes for Rozek although Boulderado is too small to file 13F. Sardar - are you paying attention to this new twist? Seems like you need to make some tweaks to the Lion Fund's structure within BH. I think the only way to figure out if they're not taking incentive fees at their hedge funds is to ask Peterson/Rozek directly as I don't think it would need to be included in a BOMN SEC filing as this is specific to their funds, not BOMN. Even if they weren't, the incentive fee structure at BOMN (without a high water mark) is massively too generous in this day and age. Given that there have been a number of positive comments about the integrity of the HF managers, I would be surprised if they were collecting incentive fees from their LPs on the appreciation of the BOMN investment. Nonetheless, it's surprising that this company was mostly funded by the respective hedge funds rather than from the managers' personal capital. A prior comment suggested that Boulderado was almost entirely Rozek's money so it is irrelevant for him but does Magnolia have outside investors? Even though I assume the LPs have been very pleased with the performance Magnolia, I can't imagine a 40% position in a holding company is exactly what they had in mind. Does anyone have an idea of the liquidity terms of his fund? Any redemptions out of Magnolia could have a dramatic effect on the trading price of BOMN. Subject Did BOMN make a blockchain or something? The stock is up 14% right now. Does anyone have an idea why? Subject Re: Did BOMN make a blockchain or something? Investors are always looking for the next Warren Buffett. Some are hoping they have found him in the same family tree. 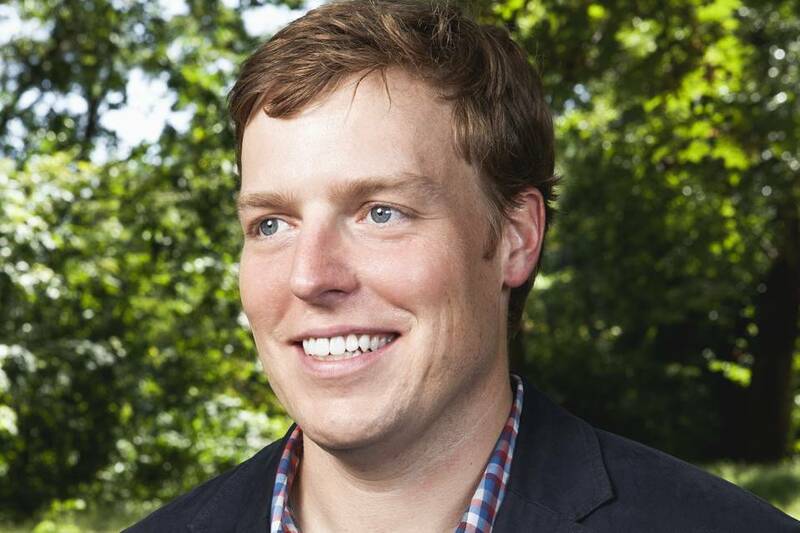 Shares in a small company tied to Mr. Buffett’s grandnephew Alex Buffett Rozek have nearly doubled since listing on the Nasdaq in June, outpacing the S&P 500’s 10% gain during that time. Boston Omaha Corp. BOMN +13.32% based in Omaha, Neb., sells billboard advertising and surety insurance, and Mr. Rozek is the co-chief executive. Mr. Rozek and his business partner Adam Peterson say they get no help from Mr. Buffett or his company, Berkshire Hathaway Inc. Boston Omaha doesn’t advertise the connection, and the name Buffett doesn’t appear in the company’s annual letters or news releases. Mr. Rozek said he wants the company and its results to stand on their own. That hasn’t deterred investors. Boston Omaha has a market capitalization of $363 million, 2.4 times its book value, after completing three acquisitions by its surety insurance business since June. The company reported $2.4 million in third-quarter revenue, up from $1 million a year before. Mr. Rozek might be best known to Berkshire investors for proposing to his now-wife in front of a crowd of thousands at Berkshire’s 2009 annual meeting in Omaha. His billionaire relative called on him for the final question, which became the proposal. Mr. Buffett then told the crowd that Mr. Rozek was his sister’s grandson. Still, some investors say the similarities are obvious. Like Berkshire, Boston Omaha looks to buy companies with consistent earnings and strong competitive positions, let them run independently and hold them forever. Both companies skip earnings calls in favor of an annual letter to shareholders and an annual meeting. 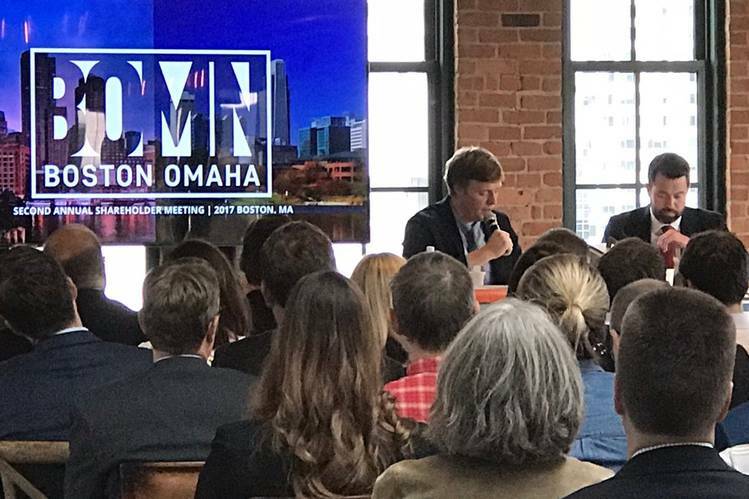 “The parallels are easy to make” between Boston Omaha and Berkshire, said Josh Jarrett, a private investor who wrote an analysis in June recommending Boston Omaha for the Value Investors Club, a members-only online forum for value investors. At Boston Omaha’s current valuation, “you’re definitely pricing in some of that future expectation and hope around what could be,” Mr. Jarrett said. He also attributed the stock price rise to Boston Omaha’s recent acquisitions. Messrs. Rozek and Peterson met in 2013, when they were each running an investment partnership focused on equity investing. The two teamed up in 2015 to buy Houston real-estate company REO Plus Inc., which they renamed Boston Omaha after their two home cities. Mr. Peterson’s investment fund, Magnolia Group LLC, currently owns 55% of Boston Omaha, and Mr. Rozek’s Boulderado Group LLC and other entities he manages own 12%. Mr. Buffett also ran investment partnerships early in his career before unwinding them as Berkshire grew. Berkshire is now one of the world’s biggest companies, with a $488 billion market capitalization and subsidiaries that include Geico, Dairy Queen, Duracell and Fruit of the Loom. It also invests in publicly traded companies such as Apple Inc. and Wells Fargo & Co.
Boston Omaha doesn’t currently invest in equities. Mr. Rozek lives in Boston and Mr. Peterson in Omaha. They see each other about once a month. Mr. Rozek, who walked on to the University of North Carolina at Chapel Hill football team his junior year of college, often travels with one of his four Australian shepherds in tow. Mr. Peterson, an Omaha native, is the quieter and more pessimistic of the two, say friends and investors. Mr. Jarrett’s analysis of Boston Omaha suggested that Mr. Peterson might be related to Chuck Peterson, who was Mr. Buffett’s college roommate in 1947 and an early investor in Mr. Buffett’s investment partnership. The rumor has persisted among investors, but Adam Peterson and Mr. Buffett said there is no relation. Boston Omaha’s first acquisitions were in the billboard business. The company owns more than 500 billboard structures in four states through its subsidiary Link Media. Billboards require little upkeep, and regulations make it difficult to build new ones, making them attractive to own, Mr. Peterson said. 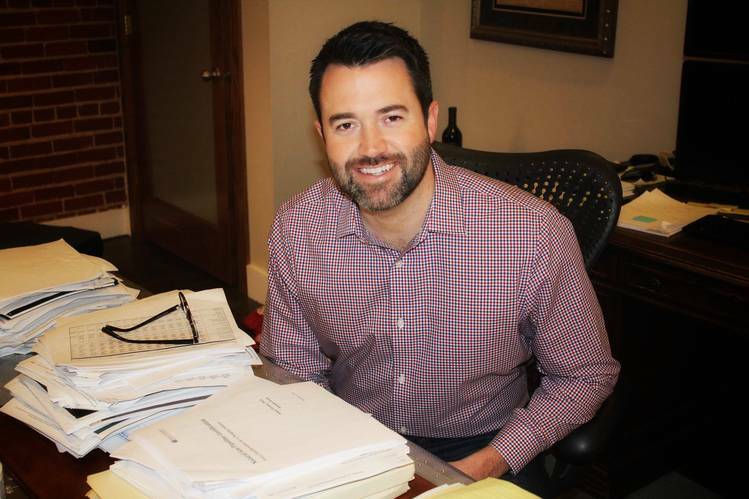 In 2015, Boston Omaha launched a surety-insurance company called General Indemnity Group. Surety insurers guarantee performance or payment, often in the construction industry. This type of insurance tends to pay out a lower percentage of premiums in claims compared with other types of property and casualty insurance. Mr. Rozek’s family hardly came up at Boston Omaha’s annual meeting in Boston in June, according to investors who attended. There was a WSJ article today drawing attention to the Buffett angle. While I stand by my analysis, this has obviously been a bad short idea thus far. If these guys were smart (and I think they are), they would do a massive secondary (or otherwise issue equity, perhaps via M&A) at these elevated prices. One ("hedge"?) idea related to BOMN is to buy Nicholas Financial (NICK). Magnolia Capital owns 18% of NICK and has a board seat. NICK trades at roughly two thirds of book (compared to BOMN, now, at over 2.5x book). Could BOMN issue shares at (say) 2.3x book to acquire NICK at (say) 0.9x book? Regardless, NICK looks cheap and the market is saying that Magnolia is smart. Perhaps they can work some of their magic on NICK as well (and note it is similarly illiquid). NICK just hired a new CEO and filed his compensation arrangement in an 8-k. There are many old VIC write-ups on NICK for further context. Subject Re: Re: Did BOMN make a blockchain or something? I don't see any news to justify the stock up. But to state the obvious, the valuation of BOMN is completely divorced from reality given that it's loss making and trades at 2.7x P/B. If anyone has 2014-current returns I'd be interested to see them. So basically Magnolia doesn't short and Peterson's returns have matched the market with the exception of 2007 and 2009 where he outperformed by about +25% in each year. So a reasonable track record, but certainly not a track record that should cause investors to compare him to the slightly more famous Buffett. Regarding NICK, I've looked at the company and while I agree that it's cheap, there's nothing in the near to medium term to get one excited. See yesterday's TOP story on subprime auto lending. NICK isn't going to do well until things get worse in subprime auto lending and aggressive players get knocked out. Subject Re: Re: Re: Did BOMN make a blockchain or something? I'm not short but you think it's plausible that they compound BV at 15% (gross) while US markets return less that 7% annually? So if markets do 6% then those two beat by 9% per year? How many people/funds were able to beat by 9% annually over a 10 year period? Maybe I should be short. Subject Re: Re: Any Fiduciaries/CFAs Ouf There? Subject Re: When To Cover? I'm also short but my bet is they don't do a new equity raise anytime soon. You mentioned fiducioury duties but I doubt executives really have a duty to sell new equity whenever they think the shares are (grossly) overvalued. And the other side of that is assuming this eventually trades around or at a small premium to BV - do they really want to add a bunch a disgurntled investors who are going to be way underwater for a very long time? I believe they have a shareholder base they're aiming for, and it isn't the guys buying a holding company at ~2.5x BV. Wouldn't it be better to just ignore price movement, keep doing your job, and wait for this mania to pass? I don't know these guys but that's what I would've done if I was looking to build something for the long-run. Subject Re: Re: When To Cover? WHAT WOULD JESUS DO...OR WHAT WOULD WARREN DO? 1) It seems the momentum that drove the stock up has dried up and the stock should trade down further since there is no institutional support. Even though the stock is down from its highs, its still up significantly and still signficantly overvalued. I don't beleive that the recent deals will have changed book value much. TBV may have fallen a bit, as some of the purchase prices may have been allocated to goodwill. If they did good deals, then intrinsic value may have grown, but it is difficult to determine whether that is the case at this point. stock reaction has been somewhat puzzling, no? Boston Omaha announced a $150mm private placement to Magnolia Group and Boulderado Group at $23.30 per share late last night. Why would Rozek and Peterson do this at that price? One would think they could have bought this stock at a far cheaper price considering they are issuing nearly 50% of the current shares outstanding. Any thoughts on the rationale? Maybe they saw the stock reaction in December post the WSJ article and thought this would a great way to issue the $50mm shares (via the ATM) at a large premium? $150mm is just a lot of money especially when they previously issued stock at only $13 8 months ago. They couldn't possibly think the business has increased in value that much when they had only spent a fraction of the initial proceeds. By investing through their funds they each get paid twice, with no high water mark on the comp from BOMN. The price they invest in doesn't matter as it relates to the comp from BOMN since it's based on change in equity. They are personally incentivized to put every last dollar of capital from their funds into BOMN regardless of price. If the stock sinks they can just have Barrons do a writeup on it in the last week of December. I would imagine they will eventually have BOMN buy their funds (perhaps after liquidating non-BOMN positions) and parlay callable capital into permanent capital, trading up for a better comp scheme in the process. Subject one thing I dont understand.. Isn't the MIBP excluding issuances from compensation? Yes Book value increases by issuance - but shouldnt that be accounted for? The MIBP provides for a bonus pool, determined on an annual basis by the Compensation Committee of the Board, equal to up to 20% of the amount by which our stockholders’ equity for the applicable fiscal year (excluding increases or decreases in stockholders’ equity resulting from any issuances, purchases or redemptions of our securities) exceeds 106% of our stockholders’ equity for the preceding fiscal year. Subject Re: one thing I dont understand..
You're right that capital raises don't count towards incentive compensation, but I think milehigh's point was that there hasn't been any value creation here despite the fact that financial data providers will show increases in book value per share. But the incentives and conflicts here are still LOL-worthy, and the co-founders will want as big of an equity base as possible since it's the equivalent of AUM. With no high water mark, all you need is that One Good Year...that's all these guys are thinking about. I also anticipate BOMN using some creative deals and/or accounting to create non-economic increases in equity, like what Kingsway has done by going to absurd lengths to figure out how to release material amounts from their valuation allowance (despite being consistently unprofitable) which increase equity but has no economic value at all. Coffee1029 is right: incentives trump all. A friend of mine recently redeemed from Boulderad, disgusted by all of this. Bowd, I just saw your earlier question about the structure of the investment in DF Holdings ("what the heck is this and what's the point?"). A performance-based adjustment to the purchase price like this can be used to bridge the gap when there is a disagreement about valuation in a privately negotiated transaction with a private co. In this case, it appears the bid/ask was $140m/$200m: BOMN wanted to pay a $140m valuation, but DF Holdings thought $140m was too cheap, because they believe they are going to achieve ≥$60m of consolidated net income in 2018 / 2019 combined. DF's counter was that the valuation should be $200m if they achieve that net income target. Agreeing to pay the $200m valuation with the performance-based adjustment enabled them to bridge the bid/ask and complete the deal rather than simply walk away due a to a disagreement over valuation. Any reason why? Some other feature on these guys in a financial publication? I also wanted to mention to you that I thought this was a great idea with some very bad luck. I think shorting a publicly traded investment firm consisting of mostly cash at 2x book will work out well (at the very least not hurt you over the long term) 9x out of 10. It was impossible to predict that the founders would anti-dilute the rest of the shareholders with $300 million of cash at a massive premium to book value. Envirostar (EVI) is BOMN on steroids. It trades at 8x book value and the book value is entirely money they have raised and made acquisitions with in the past 2 years. $439 million market cap vs. $56 million book value, $20 million net debt. Are you sure you want to close this position BOSTON OMAHA CORPORATION? Are you sure you want to Flag this idea BOSTON OMAHA CORPORATION for removal?